Our gift hampers can be delivered to Chatswood, we offer a same day service to this area. Please check the right selection on the shipping options page. iGift® Hampers are ideal for Baby Gifts, celebrate the arrival of a new baby with one of our specially made new baby gift hampers. The first hampers were simply used to carry food in early agricultural society. Basket-making guilds in Britain date back to at least the 15th century, and wickerwork was produced much earlier in the Medieval period. These baskets would only have been used to cart farm produce back from the fields and to market, as the woven material was sturdy and light enough to hoist on your back. Raw foods straight from the earth like turnips and potatoes are a far cry from the tasty fruits, chocolate, gourmet food and alcohol we pack in our hampers today! The other major use for hampers was transporting your own food – from travellers contemplating a lengthy coach journey to field-labourers setting out for a day’s work, hampers were used to fuel the long hours ahead. They naturally would have contained more simple fare than that nice bottle of Prosecco that you might find in gift hampers now, but staples like meats, cheeses and bread are still part of the wider tradition of hamper-giving today. When travelling the country and Continental Europe became fashionable for the elite in the 18th Century, hampers became a little more upscale, and might have featured things like game pies, preserves and fruit cake to keep ladies and gentlemen going on the road. Coaching inns began to provide them to send their esteemed patrons on their way. Hampers are often synonymous with picnic baskets, and although food was taken out for hunting expeditions in the Medieval era, the leisurely picnic-for-picnic’s sake only became popular in the Victorian period. Summer days in the 1800s for the gentry would be filled with parties heading out into the country and to sporting events like Eton cricket matches and days at Epsom Derby, though the set-up was a lot more formal then – servants would have to carry tables and chairs out for the picnickers to lounge on! Others had found a different use for hampers potentially as early as the Norman Conquest, with reports of William the Conqueror himself bringing baskets of gifts across the Channel. In any case, the roots of the word, from the French ‘hanapier’ meaning a case of goblets certainly suggest some Continental influence was involved somewhere! However, it wasn’t really until much later that hampers became something to give to another, rather than consuming yourself. Well-off Victorian families started a tradition of giving a hamper to their staff at Christmas, although these often contained things like clothes and useful tools to set them up for the rest of the year. This seasonal gift-giving spread and became more sustainable with the advent of the railways during the early 19th century, when fresh foods could be transported quickly enough to reach those in another county, or even country. More functional, energy-building foods for the lunch hamper like cheese and bread were gradually replaced with jellies, chocolates and fine wines for a gift hamper. Whether it’s a selfless gesture to someone far away who needs it, or a cheer-up treat for a friend who’s had a hard time, hampers can now fit almost any occasion. They’re still used for saying thanks to hard-working employees, or just as a gesture to relatives on the other side of the world, as reminder that you’re thinking of them. As for our hampers at iGift Fruit Hampers, they obviously reflect our love of all things fruit! With gifts like the Fruit Box Hampers, from Fruit Basket Gifts to Fruit Towers and Fruit Hampers with Chocolate, we like to think our hampers continue the historic tradition of making people smile. You can also widen the appeal for any wine aficionados out there, with our Champagne and Wine Hampers including rich fruity reds, crisp chilled whites and a touch of fizz if you want to help someone celebrate. Chocolate liqueur hampers are available for real chocolate fans, and beer and whisky drinkers aren’t left out either, with our Special Alcohol hampers. Though we’ve seen that hampers have a long and illustrious past as useful lunch packs, noble charity donations and seasonal gifts, the best part about modern hampers is that you can make your hamper say exactly what you want to say, with personalised special occasion bundles. Whether you have a son or daughter who’s passed their driving test, nailed important exams or even welcomed a new addition to the family, include a personalised card and you can congratulate them personally! Why should you send fruit baskets instead of flowers? No matter the special occasion, when people can’t think of a proper gift, they tend to send flowers. Flowers are indeed beautiful and they smell wonderful, but they also have some downsides. A flower bouquet will not last longer than a few days. It will eventually wither so the bouquet will no longer look so pretty and will definitely not smell so nice anymore. To sum up, you will probably spend a lot of money on a flower arrangement just to see it thrown away after a short while. So why not send something more thoughtful and more useful, like a fruit hamper? The person you will send it to will surely appreciate it more than a bunch of flowers. Besides, there will certainly be a lot of others sending enough of them. If you think about it, a gift basket of fruit looks like a bouquet of flowers in bloom. It is beautifully wrapped, colored and above all, healthy. If you want to make it even more interesting, you can also customize it by adding chocolate, a fine bottle of wine, some silk flowers that will last forever or a cute stuffed toy. Maybe you are wondering about the events on which you can send such a gift. The answer is simple: there is no event on which a fruit hamper would be a bad idea. You can send a baby hamper to a new mommy or for a baby shower. Imagine the look on her face when she sees that she finally received something more useful than the flowers she is already surrounded by. It will surely be a great idea as a birthday gift. If we are talking about a man, you can add a bottle of alcohol to the fruit basket, and if it is a woman, chocolate or silk flowers might do the trick. Sending fruits as a gift to someone who is in hospital is a much more inspired idea than a flower bouquet with a “Get well” card. Fruits can help them get back on their feet quicker while the flower perfume can make them nauseous or allergic. You can send a gift basket even if there is no special event to celebrate. It can be a way of showing your love and gratitude. On Valentine’s Day you can show a little love to your sweetheart and on Mother’s or Father’s Day, your sense of appreciation towards your parents. On funerals you can send your condolences, avoiding certain flowers that will only remind the family of their loss. The Holidays are also a perfect occasion to receive such gifts. You can order a Christmas hamper before going home to celebrate this special evening with your family. Another event, on which you cannot fail with a fruit basket gift, is when having a birthday “party” at the office. You are probably not so close with some coworkers, so instead of being the 25th of your colleagues offering flowers, just order a nice fruit hamper and watch them smile while you are handing it to them. Fruits can be delivered to your workplace without any occasion. It can just be a way of showing the company’s commitment to health and its employees. 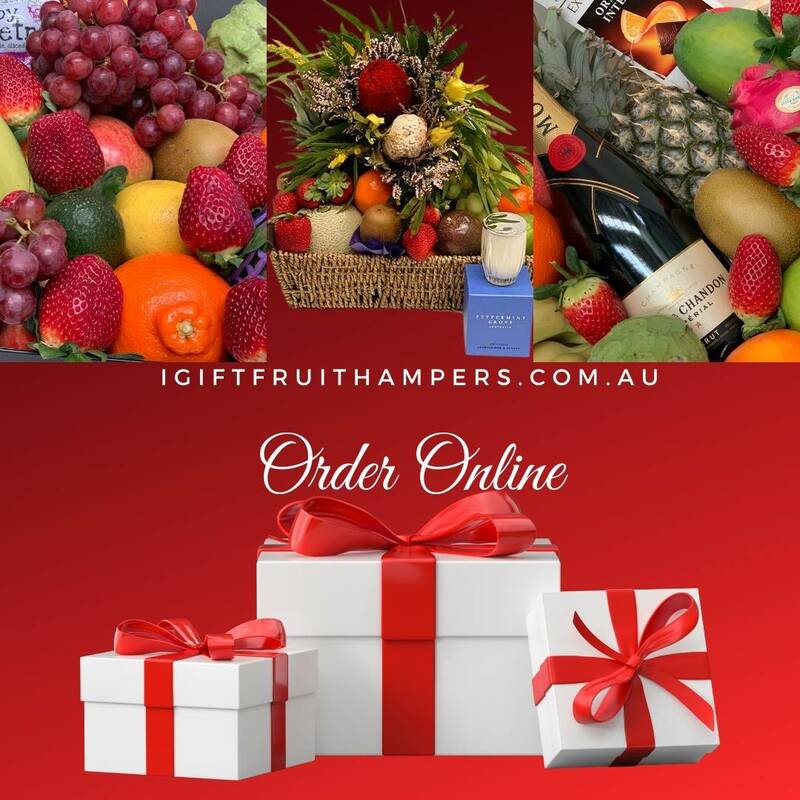 If you have no idea where to buy a fruit basket in Australia, then here is a hint: visit iGift Fruit hampers. These guys have prepared for you the most beautiful hampers. You can choose one from the lists or you can customise it yourself. Besides, if you find it hard to decide, you can always contact them and ask for help on the live chat. Your gift fruit hamper will be packed with love so why not send a very “fruitful gift” and put a smile on someones face today. Granted, that’s a standard, secondary question traded between friends or neighbours, usually after a “Hi, how you doing?’. This Christmas take the stress out of shopping and order your fruit gifts online. We include Free Shipping with all of our Fruit Hampers and Fruit Baskets. Our Fruit Gifts are delivered to Sydney, Melbourne, Gold Coast, Brisbane, Canberra and across NSW, VIC, QLD and ACT. We buy the freshest fruit available at great quality and competitive prices – which we pass onto our customers, who order fruit baskets. But fruit hampers and fruit baskets are only two features of what iGift Fruit Hampers calls a multifaceted operation that caters to each customer’s particular needs. Chocolate, wine, stuffed animals, gourmet food and, of course, fruit gifts for every occasion are available throughout the year. Give the gift of Fruit and let them know how much you care!